Colors Delhi Pinkathon, an initiative to raise awareness about the importance of a healthy lifestyle for women and issues like breast cancer, concluded its fifth edition in Delhi on September 17 at Jawaharlal Nehru Stadium. 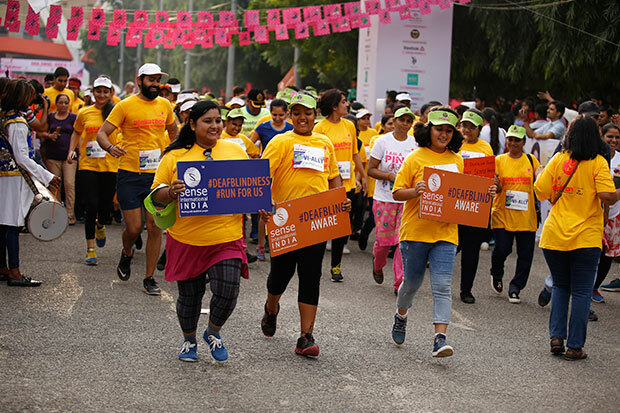 10,500 women across age groups participated in the VWash plus 3km, Optum 5km and Tata Salt Lite 10km multi-category run and 21 km categories. Flagging off the run was super-model, fitness enthusiast and avid barefoot runner and Pinkathon founder Milind Soman along with Mann Kaur, a 101-year-old woman athlete, and RJ Swati from Red FM who expressed their wholehearted support for the noble cause. Colors Delhi Pinkathon received huge response from corporate sponsors such as Colors, Bajaj Electricals, Tata Salt Lite, VWash Plus, Optum, Reebok, Apollo Hospitals, Red FM, Bisleri, ICICI Home Loans, US Polo, Enthusionz and Bajaj CSR. Medical Partner Apollo Hospital provided a medical tag for every participant of the Colors Delhi Pinkathon 2017. The medical tag will provide a free mammogram to all the participants above 44 years of age and a free medical examination check-up for those who are under 44 years from Apollo Hospital. As a precursor to the main day, the team organised unique events such as Cancer Shero Trek. A Shero is a cancer survivor and this event is dedicated towards felicitating these inspiring people. Starting with a trek, this event felicitated inspiring cancer survivors honouring them with an “I Inspire” medal. In the Colors Delhi Pinkathon, 100 visually impaired girls and 50 hearing impaired girls participated in different category runs. To prepare them for the main day, unique training sessions were designed in coordination with the sighted runners. Colors Delhi Pinkathon inspiring partners Bajaj Electricals is organising special training runs in various parts of Delhi for the registered participants who have requested training for the main day. Pushpa was announced as the mascot for the visually impaired squad who will be the running the Vwash plus 3km category. Meenu Madan, a cancer survivor, was announced as the mascot for the Optum 5 km and RJ Swati from Red FM was announced as a mascot for Tata Salt Lite 10 km category run. They were presented with the first bib. Soman also highlighted the concept of Pinkathon ambassadors in every city who are passionate, extraordinary, committed men and women connecting for one cause, health for every woman. Each Pinkathon Ambassador is a part of the core team and registers all the women in their circle of influence. Pinkathon inspires everyone that together, we will do more. 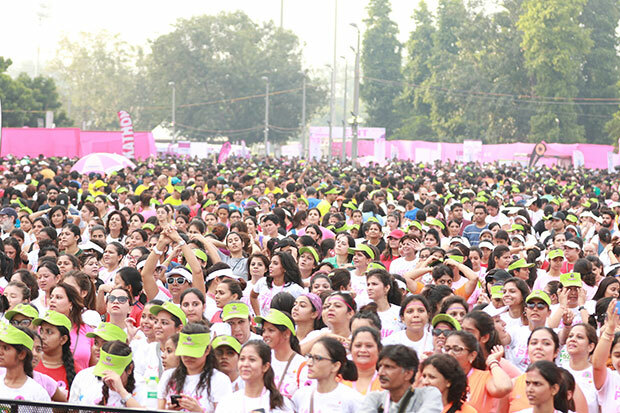 Various initiatives are undertaken by the Pinkathon Ambassadors to connect with women across various strata of the society. ‘A Colors Delhi Pinkathon goes to School’ is another interesting concept to encourage mother-daughter teams to run together. The idea is to encourage health and fitness at every age. Bajaj Electricals will be planting 1,000 trees to commemorate the Colors Delhi Pinkathon going green. 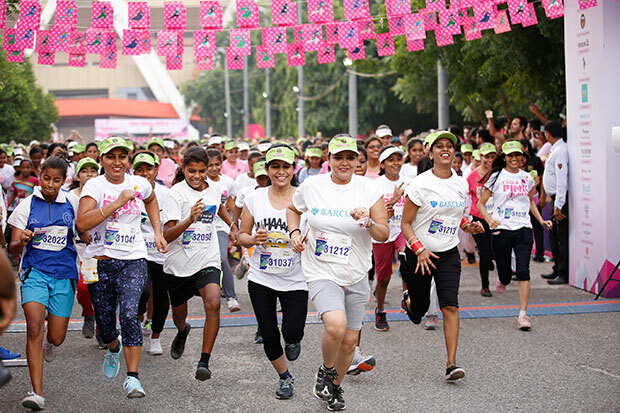 The focus of the India’s biggest women’s only running event is to encourage an active lifestyle and overall fitness among women, while creating awareness about breast cancer and bone health and encourage thousands of first-timer women to take up running. All proceeds raised from the event will be used for the expenses incurred in organising and marketing the event, and by the Women's Cancer Initiative in its fight against breast cancer.